It is the first time for me to cook abalone. Since Chinese New Year is quite near, abalone becomes a popular choice in supermarket. My husband just stared at those abalone for a little while, and I knew for sure that he wanted to have some. I decided to cook them in the easiest way, and which is steaming. Clean abalone. Gently separate the meat and the shell. Because I found the shell seems to be impossible to be completely cleaned, so I thought I’d better discard the shell. Also remove the intestines and wash off all the dirt. Soak vermicelli in hot water till soft and drain them. In a small bowl, add in 1 tsp light soy sauce, 1/2 tsp cooking wine, 1/2 tsp oyster sauce. Mix well. Heat 1 tablespoon oil in a pan. Add in 3 or 4 cloves of chopped garlic. Saute till aromatic. Place vermicelli in a plate. Pour the sauce in evenly. 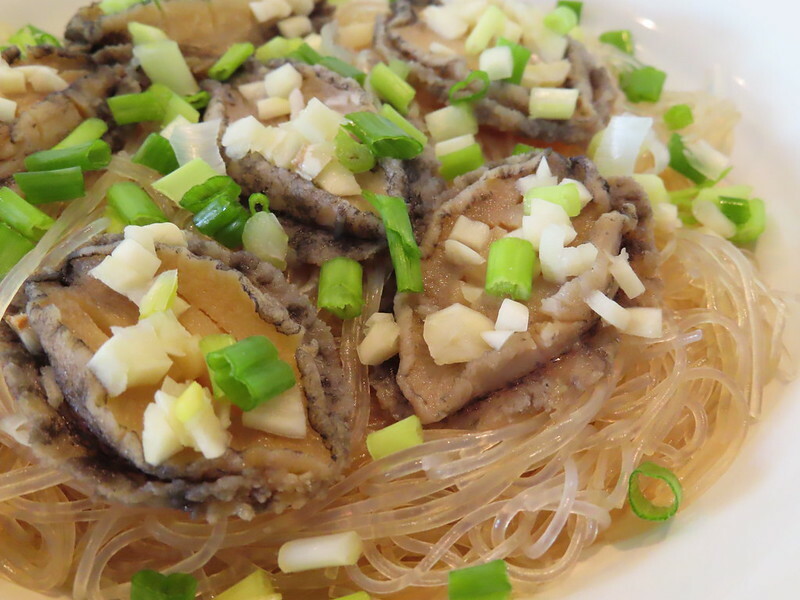 Then scatter abalone on the vermicelli. Top abalone with garlic. If there is still some extra garlic, just place them over the vermicelli. In boiling water and steam for about 8 mins. Vermicelli will be very tasty and my husband loved it. Where do you buy the fresh abalone with shell ? How much each? They are frozen ones but with shell. $15/pack (6 pieces).